By Rachel Held Evans, on May 31, 2017. The Spirit is like breath, as close as the lungs, the chest, the lips, the fogged canvas where little fingers draw hearts, the tide that rises and falls twenty-three thousand times a day in a rhythm so intimate we forget to notice until it enervates or until a supine yogi says pay attention and its fragile power awes again. Inhale. Exhale. Expand. Release. In the beginning, God breathed. And the dust breathed back enough oxygen, water, and carbon dioxide to make an atmosphere, to make a man. Job knew life as “the breath of God in my nostrils,” given and taken away. With breath, the Creator kindled the stars, parted a sea, woke a valley of dry bones, inspired a sacred text. So, too, the Spirit, inhaled and exhaled in a million quotidian ways, animates, revives, nourishes, sustains, speaks. It is as near as the nose and as everywhere as the air, so pay attention. The Spirit is like fire, deceptively polite in its dance atop the wax and wick of our church candles, but wild and mercurial as a storm when unleashed. 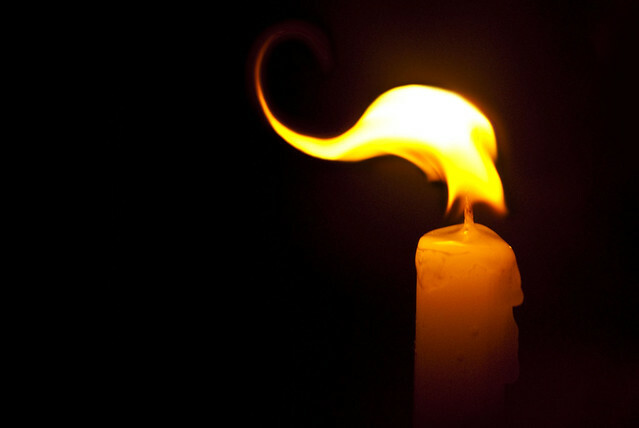 Fire holds no single shape, no single form. It can roar through a forest or fulminate in a cannon. It can glow in hot coals or flit about in embers. But it cannot be held. The living know it indirectly—through heat, through light, through tendrils of smoke snaking through the sky, through the scent of burning wood, through the itch of ash in the eye. Fire consumes. It creates in its destroying and destroys in its creating. The furnace that smelts the ore drives off slag, and the flame that refines the metal purifies the gold. The fire that torches a centuries-old tree can crack open her cones and spill out their seeds. When God led his people through the wilderness, the Spirit blazed in a fire that rested over the tabernacle each night. And when God made the church, the Spirit blazed in little fires that rested over his people’s heads. “Quench not the Spirit,” the apostle wrote. It is as necessary and as dangerous as fire, so stay alert; pay attention. The Spirit is like a seal, an emblem bearing the family crest, a promise of belonging, protection, favor. Like a signet ring to soft wax, the Spirit impresses the supple heart with the power and prestige of God, and no one—not kings, not presidents, not the wealthy, nor the magisterium—can take that identity away. The bond of God is made of viscous stuff. He has put his seal on us, wrote the apostle, and given us his Spirit in our hearts as a guarantee (1 Corinthians 1:22). In the rite of confirmation, which acknowledges the presence of the Spirit in a believer’s life, a thumb to the forehead reminds God’s children of their mark: the seal of the gift of the Holy Spirit. It’s as invisible as your breath but as certain as your skin, so pay attention; don’t forget who you are. The Spirit is like wind, earth’s oldest sojourner, which in one place readies a sail, in another whittles a rock, in another commands the trees to bow, in another gently lifts a bridal veil. Wind knows no perimeter. The wildest of all wild things, it travels to every corner of a cornerless world and amplifies the atmosphere. It smells like honeysuckle, curry, smoke, sea. It feels like a kiss, a breath, a burn, a sting. It can whisper or whistle or roar, bend and break and inflate. It can be harnessed, but never stopped or contained; its effects observed while its essence remains unseen. To chase the wind is folly, they say, to try and tame it the very definition of futility. “The wind blows wherever it pleases,” Jesus said. “You hear its sound, but you cannot tell where it comes from or where it is going. So it is with everyone born of the Spirit” (John 3:8). We are born into a windy world, where the Spirit is steady as a breeze and as strong as a hurricane. There is no city, no village, no wilderness where you cannot find it, so pay attention. The Spirit is like a bird, fragile alloy of heaven and earth, where wind and feather and flight meets breath and blood and bones. The rabbis imagined her as a pigeon, the Celts a wild goose. Like a dove, she glided over the primordial waters, hovered above Mary’s womb, and descended onto Jesus’ dripping wet head. She protected Israel like an eagle, and like a hen, brooded over her chicks. “Hide me in the shadow of your wings,” the poet king wrote. “Because you are my help, I sing in the shadow of your wings” (Psalm 17:8, 63:7). The Spirit is as common as a cooing pigeon and transcendent as a high-flying eagle. So look up and sing back, catch the light of God in a diaphanous scrim of wing. Pay attention. The Spirit is like a womb, from which the living are born again. We emerge—lashes still wet from the water, eyes unadjusted to the light—into a reanimated and freshly charged world. There are so many new things to see, so many gifts to give and receive, so many miracles to baffle and amaze, if only we pay attention, if only we let the Spirit surprise and God catch our breath. Read more in Searching for Sunday: Loving, Leaving and Finding the Church. Hey Mommy Bloggers - Thanks.